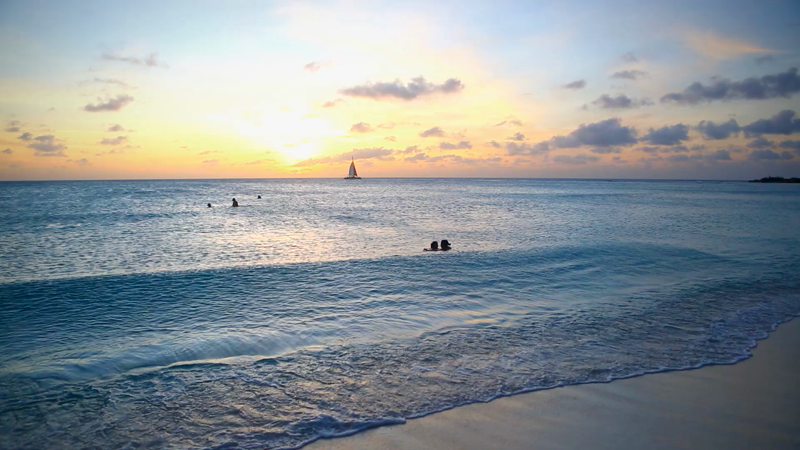 With perfect weather, gracious hospitality and spectacular beaches, it’s no wonder Aruba is synonymous with tourism. In the 1920s, Aruba had only a few visitors. Between 1924 and 1928, about 200 yachts, motor vessels and tankers were registered, bringing American businessmen and visitors to the island. For many years since its opening in 1924, the Lago Oil Refinery was the main source of employment for the island of Aruba. In the 1950s, however, due to automation many employees lost their jobs. To boost the economy, a new industry was sought and the Dutch government proposed the most feasible choice — tourism. In 1947, the Aruba Tourist Commission was established to promote and direct tourism on the island, with Ernst Bartels at the helm. In 1953, the commission officially became the Aruba Tourist Bureau (ATB). This was a small organisation with only two employees: Ernst Bartels remained chief, assisted by Casper Wever. The ATB continued the vital work of promoting Aruba as a tourism destination, especially in the United States, one of the key markets for the Caribbean. The Caribbean Hotel, Aruba’s first multi-story resort hotel, opened its doors in 1959, quickly becoming a favourite getaway for world-famous jet-setters. From that time until 1977, the number of hotels increased to 16, with five of them proudly housing their own casinos and the total number of rooms reached 2,148. In January 1983, U.S.-based firm Sasaki Associates, assisted by several government agencies, concluded a six-month study dealing with the development of Aruba’s main tourism corridor — the coastal area extending from Oranjestad to California Point in the northwest corner of the island. With its wide beaches, warm sea waters and easily developable land, this area became the focus of Aruba’s tourism growth. Major investments by the government in roadways, waterlines and other infrastructure facilitated large-scale resort hotel development. When the new roadway network was developed, great care was taken to protect environmentally sensitive areas, including the unique geological formations and dunes of Arashi/California Point, as well as several salt flats that serve as home to wildlife during rainy periods. In general, the developers sought to preserve the beauty of the existing desert landscape and native vegetation. By 1984, tourism was a well-developed sector of the Aruban economy, second only to the oil-refining industry in terms of its contribution to the gross domestic product. In 1985, the closing of the oil refinery, resulting from declining market value and cutbacks in the supply of Venezuelan oil, had a great impact on the Aruban economy. In 1986, Aruba achieved its Status Aparte, withdrawing from the Netherlands Antilles and becoming an autonomous entity within the Kingdom of the Netherlands. It was within this context that tourism took over as the strongest economic force in Aruba. After the closure of the Lago Oil Refinery in 1985, the Aruban government decided to invest in tourism as the main economic pillar of the island and replaced the ATB with the newly created Aruba Tourism Authority (ATA) in 1986. The ATA grew in importance, concentrating on opening new markets and expanding its marketing activities. In the period from 1986 to 1996, tourism in Aruba grew at almost twice the rate of tourism in the entire Caribbean. From 1986, when the construction of hotels resumed, until 1991, the total number of rooms more than doubled from 2,776 to 5,625. During this period, the number of timeshares also increased about fivefold, from 337 units to 1,967 units. By the end of 1996, there were 7,103 rooms, of which timeshare units totalled 2,272. The refinery was reopened in 1990 by Coastal, but tourism remained Aruba’s economic mainstay, generating the majority of the island’s export earnings. The government played a key role in the growth of tourism by devoting considerable resources to increase revenues and create employment, developing a basic infrastructure to serve hotels and other tourist facilities and directly supporting the expansion of tourist accommodation through the partial ownership of three hotels totalling about 600 rooms. Hotels are concentrated in two main areas: the hotel district in the Palm Beach area and the areas in Eagle Beach and Punta Brabo. The majority of today’s hotels fall under foreign ownership and many of them are international brands. Despite its increase in hotel capacity, Aruba enjoys one of the highest hotel occupancy rates in the Caribbean, averaging about 75% all year round. Aruba’s popularity has remained consistent, due not only to the perfect combination of sun, sand and sea, but also to the hospitality of its people, its high level of safety, its political stability and its success in various niches such as adventure activities, nightlife, shopping and restaurants. The airport, built in 1972 and expanded in 1987, has recently been modernised and expanded again. U.S. immigration arrived in 1988 and U.S. customs in 2000, setting up in a new state-of-the-art building for U.S. departures only. This dedicated facility enables U.S.-bound flights to pre-clear U.S. immigration and customs in Aruba — a huge boon for those travelling to the States. Tourism in Aruba isn’t just our livelihood; it has also become a part of our identity as a community. Educating our youth about the importance of Aruban tourism has created a service-oriented and welcoming attitude among our people. Many of our visitors come for the beautiful alabaster beaches, but they return because they left the island feeling like part of the family. Stay, play and indulge to your heart’s content at one of Aruba’s beautiful all-inclusive resorts. Our island paradise is blessed with the bounties of nature and a variety of wonders found nowhere else.